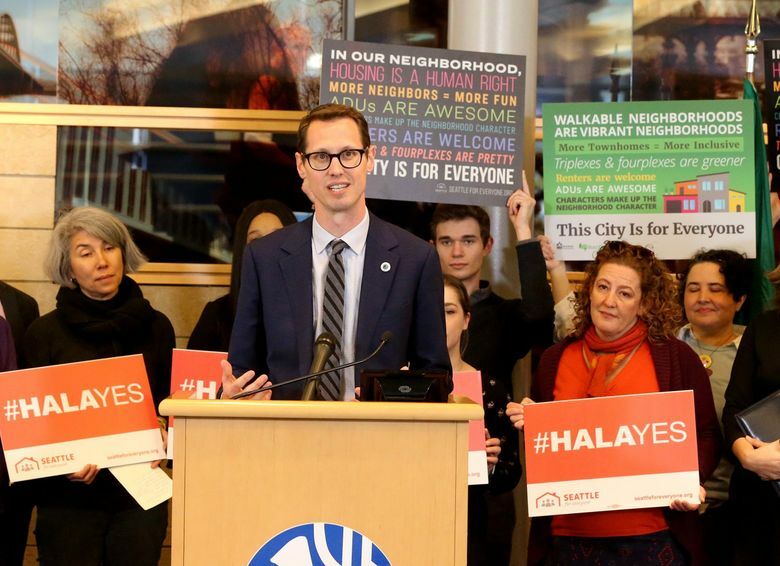 Rob Johnson will step down from the Seattle City Council on April 5 rather than when his term expires at the end of the year, he said Thursday, a few days after leading the council in a unanimous vote to upzone neighborhood hubs. Johnson’s early resignation will trigger an appointment process, and the council will have 20 days to select a temporary replacement. That person will serve until the results of November’s election are certified, at which time the winner of the race for Johnson’s District 4 seat will immediately take office. The temporary council member will take part in important matters in the next several months, such as crafting the 2020 city budget. Johnson said the council should choose a “caretaker” type for the interim position, rather than one of the candidates running in District 4, which includes Eastlake, Wallingford, the University District and Northeast Seattle neighborhoods such as Ravenna, Bryant and Laurelhurst. In a memo, Council President Bruce Harrell said the temporary council member will need to “possess the qualifications required for election” and to have lived in the district for at least 120 days. “I believe we should appoint an experienced ‘caretaker’ who agrees not to seek election to the council this year,” Harrell added, agreeing with Johnson. Johnson has had his eye on the door for months. The council member said in November he wouldn’t seek re-election and announced in January he would take a job after leaving City Hall with NHL Seattle, the professional hockey group renovating KeyArena. Before walking away, Johnson wanted to finalize a plan to allow taller buildings and affordable-housing requirements in more than two dozen neighborhood hubs. The council approved the plan Monday. In November, Johnson said he would be bowing out in 2019 because he had promised his wife he would serve no more than four years in office. Johnson’s strongest supporters have included labor and business leaders and walking, biking and transit advocates. Before running for a council seat in 2015, he led the Transportation Choices Coalition. His harshest detractors have included upzone opponents and people opposed to a 35th Avenue Northeast bike lane and road redesign. Councilmember M. Lorena González will for now take over Johnson’s land-use duties and decide whether to press ahead with changes for University Way Northeast, he said. Johnson agreed to remove the quirky street known as “The Ave” from the plan that passed Monday but has introduced legislation to upzone the strip separately. The council member intends to start with NHL Seattle next month, he said Thursday. He’ll work on getting hockey fans and concertgoers to and from the renovated arena. Johnson is one of four council members not seeking re-election this year. Three incumbents are running. There are nine candidates running for the open District 4 seat. The council last appointed a temporary council member in October 2017, tapping community activist Kirsten Harris-Talley to fill a citywide seat vacated by Tim Burgess, who departed to serve as a temporary mayor. Councilmember Teresa Mosqueda took over that seat the next month, after winning the election. This time around, the council will accept applications from Monday through April 5, Harrell said, directing would-be applicants to seattle.gov/cityclerk/council-vacancy for more information. Following a series of meetings at a public hearing, the council will vote to appoint someone on April 22, he said.